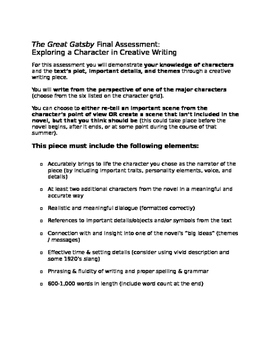 Tired of reading the same old analytical essays on The Great Gatsby? This final writing assessment is challenging, creative and analytical. It's also fun to write and read! 1. 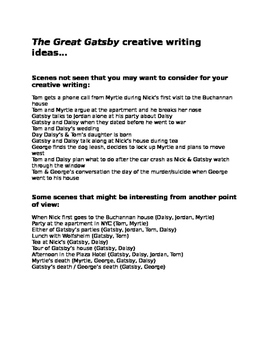 Three pages of character charts (for Gatsby, Daisy, Tom, Jordan, Myrtle, and George) to guide students' reading and note-taking with a focus on characterization. 2. 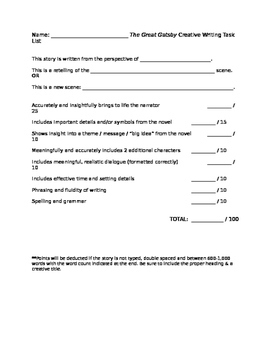 A detailed assignment sheet that asks students to demonstrate their knowledge of characters, plot, and themes by re-telling a scene or adding a new scene from a character's perspective (other than Nick's). 3. An ideas sheet to help students who are stuck (or all students, if you'd like). 4. 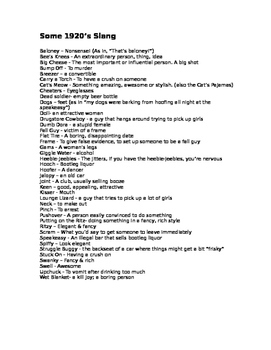 A 1920's slang sheet. 5. A guided peer-feedback sheet to facilitate thoughtful and effective feedback and revision. 6. A task list to make your grading a breeze. My students, at every level, have found this assignment a fun challenge. It's not easy and will lead to some great writing for you to read.